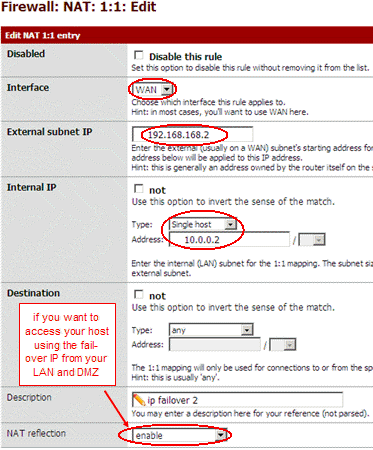 This setup is only valid for pfSense 2.0 configuration using routing instead of NAT like explained in this post. A version for pfSense 1.2.X can be found here. Fail-over IPs are IPs that you can assign to any host servers you have with OVH. When the host fails, assign the IP to another one running the same service and OVH will route traffic up to this new host. This is your job to make your host and the firewall in front of it (if any) handle this extra IP. This help to guarantee continuity of service ! First remember the network schema I use for testing. I want to add the fail-over IP 192.168.168.2 to my WEB server running on 10.0.0.2. Then I create a 1 on 1 rule to forward traffic up to IP 10.0.0.2. I can duplicate each entries about 10.0.0.2 in OPT1 and WAN panels and replace the 10.0.0.2 by 192.168.168.2 in the new entries. Or, my favorite one, use host aliases ! 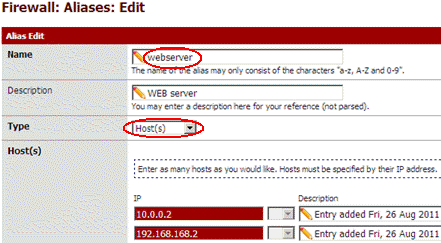 I create a webserver host alias and assign it both addresses : 10.0.0.2 and 192.168.168.2. Because this is NAT, you don't need to assign IP 192.168.168.2 to your host. 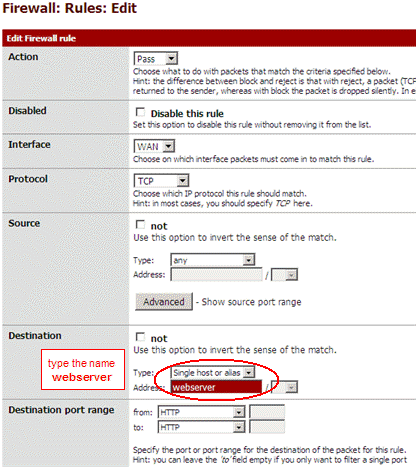 Be sure the NAT rules has also created the associated filter rule for HTTP traffic. If you need to access host 10.0.0.2 through IP 192.168.168.2 from your LAN or DMZ, you need to enable NAT reflection at bottom of the NAT rule. If you need more ports forwarding then add more NAT rules. Because this is NAT, you don't need to assign IP 192.168.168.2 to your host. You can even forward different ports up to different host inside your DMZ. I like routing but not this time ! This was my first choice for version 1.2.X, but the setting is a little more tricky this time because of changes in the routing interface ! . Use it only if you need routing instead. Second, add 10.0.0.2 to the gateway list. Now I have to update filter rules to let traffic for this new address pass trough. Look at 1 on 1 above to see how I do. Finally don't forget to assign IP 192.168.168.2 to your host. The server has 2 IPs. To answer to requests from outside, it will use the same source address as the destination address in the original request. This is fine ! But to open new connections it will choose the IP depending the outgoing route. And because the default gateway is 10.0.0.1, it will use 10.0.0.2. This is not very nice. Some applications accept to force the source IP, but not all. Using source NAT would make the use of 10.0.0.2, useless because replies would always come 192.168.168.2 even if destination was 10.0.0.2 and remote source would not understand why it get reply from 10.0.0.2 instead of 192.168.168.2. Then choose 1 on 1 instead ! Comment obtenir l'interface graphique de pfsense dans votre tutorial? quel port? que faut-il installer et comment y accéder sans WAN et la configuration VM propre à OVH? comment effectuer cette partie sous pfsense 2.0 pour une VM (1 ip, 1ip failover et 1@mac)? I'm creating a virtual LAN on the ESXi server. I install one VM with a web browser and connect the VM to this LAN. This can be a Windows, or a Linux, or even faster, a live distribution that is able to run from the ISO without any installation. 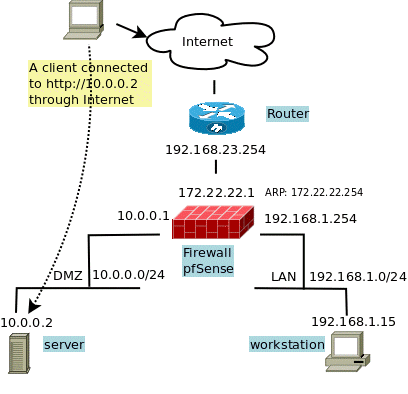 I connect the pfSense to this virtual LAN and I manage it from the freshly installed VM. I'm using the VMware console to remotely manage the Linux or Windows VM and start the web browser to setup the FW.